10.9.2014. In September I transferred my dye station from kitchen/deck to ground floor study/utility room. The ambiance is less "summer fun" and more "mad scientist." I said before that hand-dying cloth is like cooking -- many recipes to get the same "chicken soup." Unfortunately, the cookbooks are few and far between. * Upshot: no choice but to experiment. Want a color? Buy some "fiber reactive" dyes, mix tiny amounts in various proportions and use them like ink on watercolor paper to start your own recipe sampler. But don't forget to wear a face mask or respirator when handling dye powder. I decided to go full geek and get systematic. Goal: dye a bunch of fabrics to take along on our October roadtrip so I can do some stitching in the evenings. With autumn being the season and Santa Fe being the destination, a palette of reds, oranges, and purples, with a dash of green would do the trick. Fabric: Lightweight cotton lawn and harem cloth (like a tight cheesecloth), both from Dharma Trading Co. And damask linen from second-hand-store table cloths. 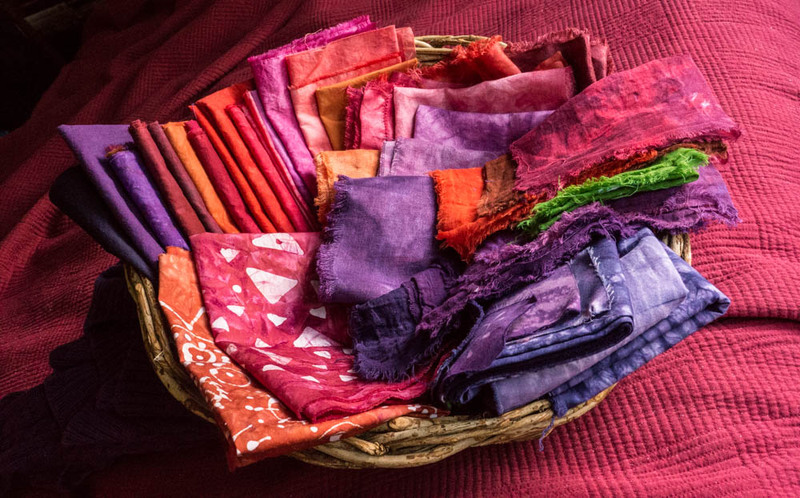 Manipulations: I did try to make shibori patterns on a few pieces of cloth, but mostly I used the "scrunch" method -- stuffing them into small containers to create variations in how the dye penetrates the fibers. Procedure: I used the exact procedure described by Jane Dunnewold in Craftsy's "The Art of Cloth Dyeing" course, which is excellent. In a nutshell: mix a gallon of chemical water (warm water, soda ash [fixative], and salt [color intensifier]); pour desired amount in second mixing jar, add powder dyes, and shake; pour dye solution over fabric. Wait an unbearable 24 hours. Wash in a cold-water cycle, with a little blue Dawn (and a couple sheets of Shout Color Catchers). Wash in a hot-water cycle, again with blue Dawn. Dry. Iron. Results: Batch 1 (8 plastic cups shown in photo above) was a little disappointing. I skimped on the dye powder, I think, so that the colors were paler than I wanted. For Batch 2, I switched containers to sturdier Mason jars and concentrated on 4 deep reds. Better! (I also included the batiked pima cotton experiments that had been waiting for color since late August.) For Batch 3, I experimented with "over-dyeing" my ugliest colors. I think my over-dye was a bit of overkill -- none of the promised subtlety came through. The fabric just got very dark. Because there were undissolved dye spots on Batches 1 and 2, I had added a teaspoon of Calgon to the chemical water for Batch 3 -- maybe that was the factor that allowed the new colors to overwhelm the old -- a factor to consider for next time. My harvest basket of cloth (photo at top), which includes my purples from early September, is a feast for the eyes. It will be hard for me to pull out a piece and start cutting into it. 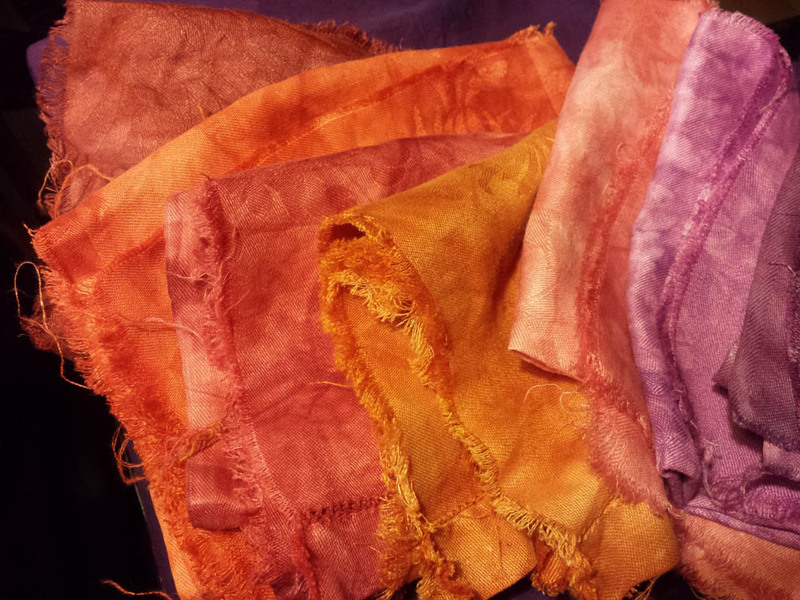 Conclusions: Hand-dying fabric with Procion MX dyes is not for the impatient or the slipshod (those folks have Rit). It's chemistry. And it's alchemy, too. 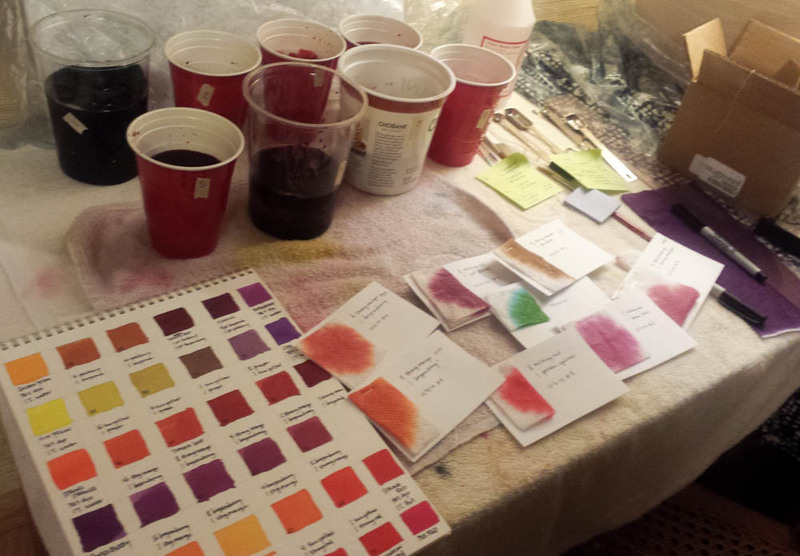 The rituals of preparing the fabric, setting up the workspace, mixing the chemicals, etc. forces a person to slow down, to focus, and to keep an open mind about the results. It's full of "what-ifs." One experiment suggests a couple more. The whole process transports me to another realm. It was hard for me to put it all away.